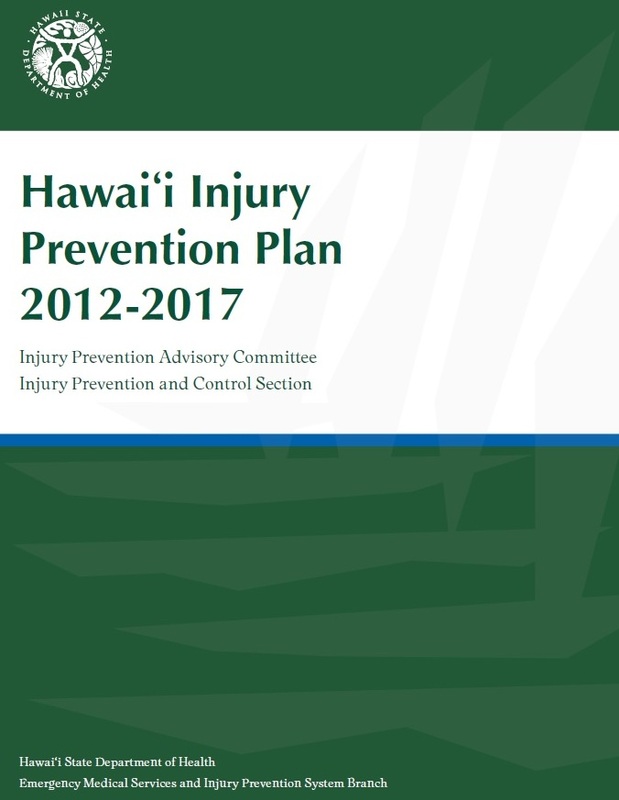 “A safe Hawaiʻi” is the vision for injury prevention efforts in Hawaiʻi. The Department of Health, Injury Prevention and Control Section, EMS & Injury Prevention System Branch, collaborates with partners across the state to address the leading causes of injury that include: drowning prevention, fall prevention, poisoning prevention, suicide prevention, traffic safety, and violence and abuse prevention. For more information on each of these areas, click on the banner below. Injuries, a major public health problem in Hawaii (56 KB), are responsible for more deaths of children and young adults in Hawaii from age one through age 40 years than all other causes combined, including heart disease, stroke and cancer. Among residents of all ages, injury is the third leading cause of death, behind only heart disease and cancer, but ahead of cerebrovascular disease, influenza and pneumonia, and diabetes. The vast majority of injuries, however, are non-fatal and can lead to a range of outcomes, including temporary pain and inconvenience, disability, chronic pain, or a complete change in lifestyle. While the greatest impact of injury is in human suffering, the financial cost is staggering. In Hawaii, injury-related hospitalizations cost an estimated $390 million annually. To provide statewide leadership in preventing death and disability associated with injuries in Hawaii by educating, supporting and mobilizing individuals and organizations to incorporate comprehensive injury prevention strategies in their daily activities. The Injury Prevention and Control Section (IPCS) is part of the Emergency Medical Services and Injury Prevention System Branch at the Hawaii State Department of Health (DOH). IPCS is the focal point in the DOH for injury prevention throughout the state for all age groups. IPCS is responsible for coordinating, planning, conducting and evaluating injury prevention programs; developing policy; collecting, analyzing and disseminating injury data; and providing technical support and training. Much of IPCS’s work is achieved through community coalitions and partnerships that strive to increase and focus resources, minimize duplication of effort and support the injury prevention activities of local agencies and organizations. Every day, the work of the Hawaii Department of Health, Injury Prevention and Control Section aims to encompass essential knowledge and skills that are widely considered necessary in the field of injury and violence prevention. These core competencies (134KB) provide a basis for professional development and are intended to guide future training and curriculum development efforts. Ability to describe and explain injury and/or violence as a major social and health problem. Ability to access, interpret, use and present injury and/or violence data. Ability to design and implement injury and/or violence prevention activities. Ability to evaluate injury and/or violence prevention activities. Ability to build and manage an injury and/or violence prevention program. Ability to disseminate information related to injury and/or violence prevention to the community, other professionals, key policy makers and leaders through diverse communication networks. Ability to stimulate change related to injury and/or violence prevention through policy, enforcement, advocacy, and education. Ability to maintain and further develop competency as an injury and/or violence prevention professional. Demonstrate the knowledge, skills, and best practices necessary to address at least one specific injury and/or violence topic (e.g. motor vehicle occupant injury, intimate partner violence, fire and burns, suicide, drowning, child injury, etc.) and be able to serve as a resource regarding that area. Traffic Safety – Fatalities among motor vehicle occupants is the fifth leading cause of fatal injury in Hawaii for all ages and the second leading cause of fatal injury among ages 1 to 34. Motor vehicle injuries also contribute to the second leading cause of injuries requiring hospitalization. Hawaii has the highest pedestrian fatality rate in the nation for older adults, and 16 out of 17 bicycle fatalities over the past 5 years involved a motor vehicle. Preventing Falls Among Older Adults – Falls are the most common type of fatal unintentional injuries in Hawaii averaging over 108 each year. They are also the leading cause of nonfatal injuries in the state with nearly 21,000 emergency room visits and 2,700 hospitalizations each year. More than three quarters of the victims are aged 65 or older and the risk of fatal falls increases dramatically as seniors get older. The emotional and fiscal burden associated with fall injuries is staggering. Drowning Prevention – Each week in Hawaii, at least one person fatally drowns. About one third of drownings occur in swimming pools. The majority of drownings in Hawaii are ocean-related, and half of those fatalities are among visitors. As an island state, it is essential that we create a safe environment and provide residents and visitors with information they need to have a safe and enjoyable experience in and around the water. Suicide Prevention – Suicide is the most common cause of fatal injuries among Hawaii residents. Over the five year period 2007-2011, 795 suicides accounted for almost one-quarter of all fatal injuries. The number of suicides for youth ages 15 to 24 surged from 15 in 2007 to 36 in 2011. It is the leading cause of injury-related death for most age groups – all but the very young and the very old – outpacing car crashes, homicide, poisoning and drowning. Poisoning Prevention – Poisoning among children has decreased with interventions such as childproof caps. However, the past few years death certificate and autopsy data have revealed dramatic increases in prescription drug overdoses. Partners from public and private sectors can all help reduce poisonings, especially prescription drug overdoses. Violence and Abuse Prevention – Violence and abuse can take many forms. They range from intimate partner violence, sexual assault, child maltreatment and elder abuse to bullying, school violence and hate crimes. These different forms of violence and abuse are often addressed independently even though they share common risk factors and prevention strategies. The banner above highlights each of the injury areas, one at a time. You can click on the photo to get more information on any area. IPCS worked closely with experts and stakeholders in each area to review accomplishments, conduct needs assessments, and develop recommendations for the next five years. Additional information about the processes used to generate these recommendations are included in the individual chapters. The Hawaii State Department of Health, Injury Prevention and Control Section (IPCS), with strong support from the Injury Prevention Advisory Committee (IPAC), completed the Hawaii Injury Prevention Plan with funding from a Public Health Injury Surveillance and Prevention Program capacity building grant and a Core Violence and Injury Prevention Program grant, both from the Centers for Disease Control and Prevention (CDC).You can download and read the full Hawaii Injury Prevention Plan 2012-2017 (PDF 4Mb). Injuries in Hawaii 2007-2011 (“the Databook”) is a comprehensive report on the leading causes of injury mortality and morbidity in Hawaii. Injuries are a major public health problem in Hawaii. They are by far the leading cause of death among children and young adults, and the fourth leading cause of death among state residents of all ages. Over the 5-year period covered in this report, a total of 3,355 residents died from their injuries. More recently updated data summaries can be found in the injury-specific menu tabs . The information in this report is for health and safety professionals, policy makers, and for everyone interested in protecting and improving the health of the people of Hawaii. The report includes descriptions of the geography and magnitude of the problem, trends, and populations at higher risk, and provides insight into some of the circumstances of these injury fatalities. It is crucial that good data be available to guide prevention and policy efforts to reduce injuries in Hawaii. This report is a first step. 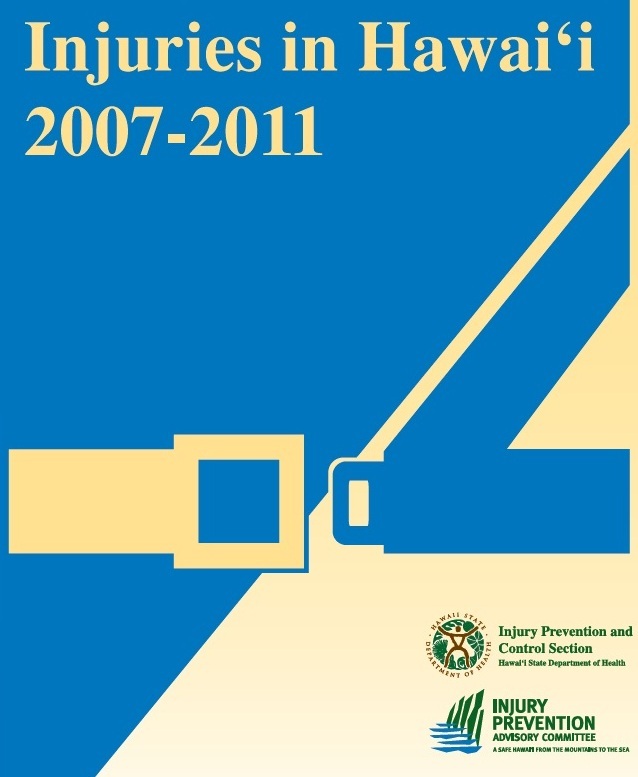 Please join the Department of Health, state and local agencies, and community organizations in working toward a safer Hawaii.You can download and read the Databook Injuries in Hawaii 2007-2011 (PDF 53Mb). Additional copies of this report and other injury prevention information may be obtained by calling the DOH Injury Prevention and Control Section at 808-733-9320.